Sweetly Entwined: "Be Our Guest"
Hi, I'm Carly! I'm a passionate baker living in Maryland. I love making the world a little bit sweeter through my baking. I I specialize in custom cookies, cakes, and cupcakes. Thanks for stopping by my site, I’m excited to share my journey of growing my business! 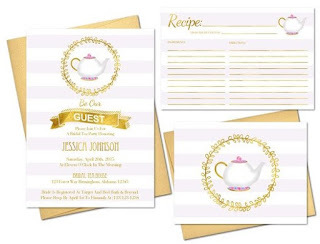 "Tale as old as time..."
When Beauty and the Beast is the bride's favorite fairytale and a part of her love story with her fiance, throwing a Beauty and the Beast themed Bridal Shower Tea is a no-brainer. So, this past weekend, the other bridesmaids and I did just that. From the moment we picked the theme, I knew I was going to decorate a Beauty and the Beast sugar cookie set and decorate cupcakes with roses using my Wilton 2D piping tip. "Try the Grey Stuff, it's delicious...."
I wish I could take credit for the cleverness of this themed cupcake -- but it's a result of a Google search for Beauty and the Beast themed desserts. One of the bridesmaids had come up with "Mrs. Potts Tea," "Chip's Chips," and "Belle's Bookworms" (gummy worms), and I was trying to continue on with tying the movie into the desserts--thus "The Grey Stuff" Cupcakes, and more! When we first began planning the bridal shower, we found these darling invitations on Etsy by Sweet Tea and A Cactus, and just had to use them! We included recipe cards with the invitations, and asked guests to write down their favorite recipes to share with the bride-to-be. Guests signed a teapot as a guest-book, which was sent home with the bride-to-be with instructions to bake and set the signatures. To aid the bride-to-be with thank you notes, there was an envelope addressing station. There was an station for guests to leave marraige advice on Jenga pieces for the happy couple to play. 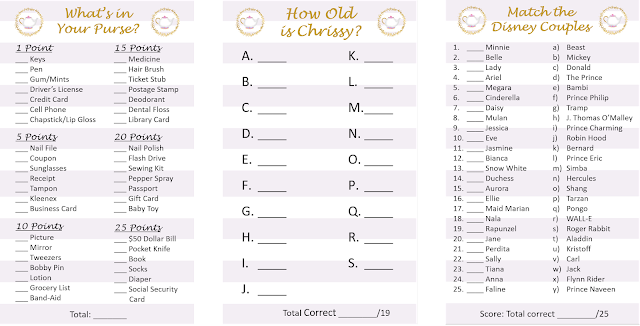 For shower games, we played "Guess the Bride's Age" with photos from her past, "Match the Disney Couples," "What's in Your Purse," and "Bridal (Present) Bingo." For the favors, we put together packets of tea for the guests to enjoy at home. And the finishing touch for the shower theme, an "Enchanted Rose." 25 Days of Christmas Cookies - Day 23!